This is virtually impossible. The odds are 1 in 281,474,976,710,656. A person playing the NCAA’s official bracket game may have done what no person has ever done before: pick every game of the tournament’s first two rounds correctly. They have somehow managed to pick all 48 games correctly and will head into the Sweet 16 with an unblemished record. The set of picks is called “Center Road” and was entered on BracketChallenge.NCAA.com. It has No. 1 seed Gonzaga beating No. 2 Kentucky in the national championship game. The odds of this happening are absolutely astronomical. If we assume every pick is a 50-50 shot, then the odds of getting all 48 right are 1 in 281,474,976,710,656. 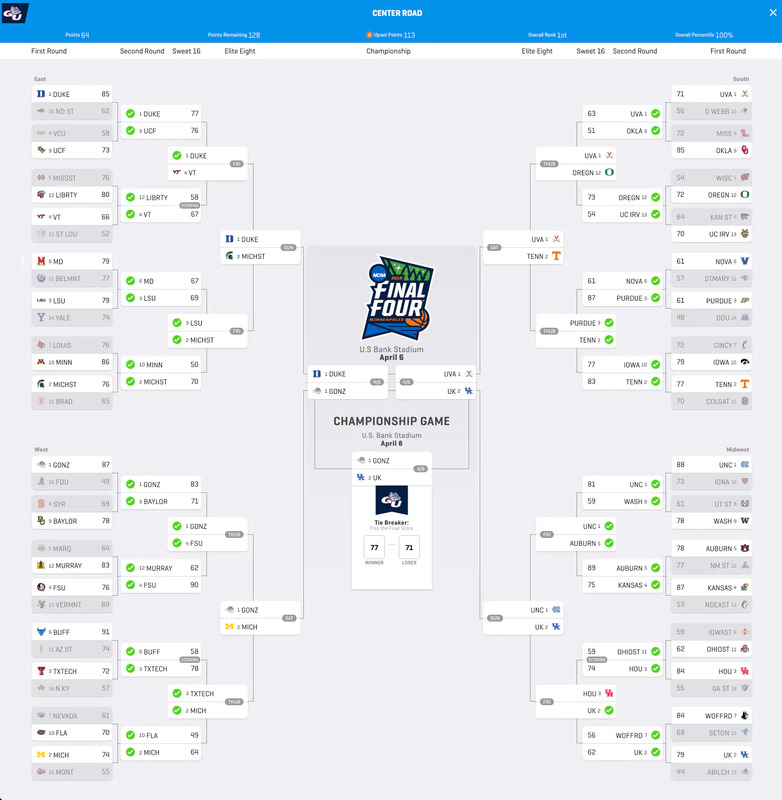 The bracket is likely the only one of the internet era to pick the first 48 games correctly. A teenager’s 2010 bracket was purported to be perfect through two rounds, but his picks were entered in a game that allowed them to be changed retroactively. NCAA.com has been tracking the pursuit of the perfect bracket since 2016 and has never seen more than 39 consecutive correct picks in any of the major online bracket games. There were only two perfect brackets after Saturday’s action and the other one (“Court Stormers” on Yahoo) bowed out when Buffalo lost to Texas Tech. SI.com’s bracket game didn’t even have anyone who correctly picked the whole first round. This year’s tournament has been unusually devoid of upsets, with only two No. 4 seeds eliminated. The Sweet 16 features every No. 1, 2 and 3 seed, two No. 4 seeds, fifth-seeded Auburn and No. 12 Oregon. "Center Road" only picked one more upset for the rest of the tournament: No. 2 Kentucky beating top-seeded North Carolina in the Elite Eight. If there ever was a year when someone would end up with a perfect record, it would be one as chalky as this. The scene in the locker room after was incredibly emotional. Nothing from the NCAA tournament will top Jeremy Lamb’s desperate heave from halfcourt after a broken player against the Raptors. The stakes were nearly nonexistent for the Hornets, but there’s no denying that’s an all-time great game-winner. It looks even cooler from this angle, where you can see Kemba Walker look away in apparent frustration after Lamb launches the shot. After flirting with retirement last year, Rob Gronkowski is walking away from the NFL just before his 30th birthday. He’s simply one of the best tight ends to ever play, as dominant as a receiver as he was as a blocker. It’s a shame his body didn’t allow him to have as long a career as Tony Gonzalez or Antonio Gates but the nine seasons he played were more than enough to make him a Hall of Famer. The lack of tournament upsets means the championship picture is wide open. ... Zion Williamson presents a unique challenge for people trying to photograph his absurd athleticism. ... Texas Tech is riding a strong defense to the Sweet 16. Noah Syndergaard came out with some very spicy quotes about the Mets. ... Lonzo and LaMelo Ball might be signing with Nike and leaving Big Baller Brand behind. ... A Rays prospect used his signing bonus to buy a school bus that he’ll live in this season. ... Mike Trout says he never considered testing free agency. Remember when portly Twins catcher Willians Astudillo said last year that he hoped by hustling to score from first he could prove “chubby people can also run?" Well, look at him motor around from first to score again, and also leg out an infield single! Former Chiefs and Eagles receiver Jeremy Maclin announced his retirement at his wife’s baby shower. Canada’s Sportsnet broadcast last night’s Canadiens-Hurricanes game in the language of one of the country’s biggest indigenous populations. Sportsnet also does regular broadcasts in Punjabi, serving Canada’s large immigrant community from northern India. Who can forget this classic Punjabi call? Rapper Lil Pump hit up Top Golf this weekend and almost walked away without a ring worth $100,000. “I hit the ball so hard that my ring fell off,” Pump said. Actually, he barely hit the ball at all. Sorry, buddy. It was the real deal. A scientist is allowing an insect to grow under his skin in his back. ... Dr. Dre’s attempt at bragging about his daughter getting into USC failed miserably.